On Tuesday, September 18, the Opportunity Starts at Home campaign hosted its first Roundtable meeting. 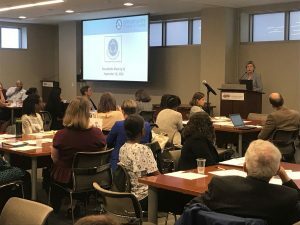 Representatives from 70 multi-sector organizations, including housing, education, healthcare, civil rights, anti-poverty, seniors, faith-based, anti-hunger, veterans, LGBTQ, and more have joined this new initiative designed to foster cross-sector engagement. Nan Roman, president and CEO of the National Alliance to End Homelessness, presenting at the inaugural Opportunity Roundtable. Participants were presented with an overview of the campaign’s mission, goals, short and long-term plans, and policy agenda. Participants then broke into small groups to discuss their own expectations for the Roundtable, to provide detailed feedback to the campaign about its ongoing strategies and tactics, and to brainstorm collaborative opportunities for the future. The Roundtable will meet in Washington D.C. three times per year. It is open to organizations of varying sizes, ages, structures, and sectors, and is primarily designed for those with a national-level focus. Representatives from the following organizations are currently engaged in the Roundtable. Participating in Roundtable dialogue does not represent an endorsement of the Opportunity Starts at Home campaign’s policy goals. Roundtable participation only indicates an interest in cross-sector engagement. Organizations with a national-level focus that are interested in future Roundtable participation can contact Mike Koprowski at mkoprowski@nlihc.org for more information.